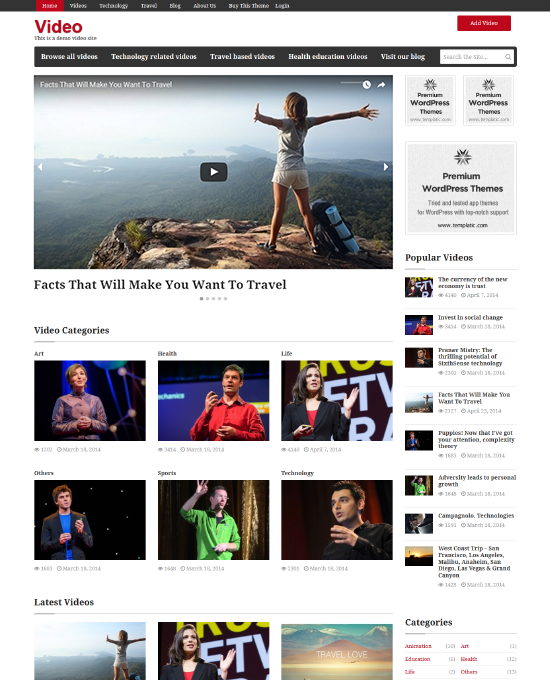 Create YouTube and vimeo like video portals using the Video WordPress theme. Show images as well as video galleries on your website. It comes with a high quality video player that plays the video in the browser. It is highly customizable and flexible. The theme has a massive list of features, check them out now. Vivo is a modern and stylish video theme that can be used to create online video portals in minutes. This theme can be used for creating multipurpose Video WordPress websites. It comes with the front end video upload as well as embed. The Video WordPress theme comes with interactive video slider, ready to use submission form, image gallery support and ad spaces. The high-quality WordPress Video Theme Page provides clients who require posting/sharing videos. These may be derived from YouTube, Vimeo, and other video sites available online. Also, one can get from all the visitors to the page. As a result, there are more subscribers. These include improved trafficking, decreased bouncing. The Videography Template Page is flexible because it is compatible for all operating systems across all platforms. Even the publishing of the video is simplified. Cost is Basic $49 for 1 domain and Premium $99 for 5 domains. The templatic Video Themes was created for mobile handset, PC, Mac and other desktop displays. Hence there is complete compatibility with all devices, the OS and platform. This allows users to independently publish own content. Users easily display easily by copy-paste method or by embedding codes directly into posts. Also, users can upload the video directly to the website. The built-in HTML5 player is used in the same site for sound production. The Vivo video theme also support mobile app view of a distinct and user-friendly view on the mobile devices. Also, the videos will look beautiful when played on mobile devices. 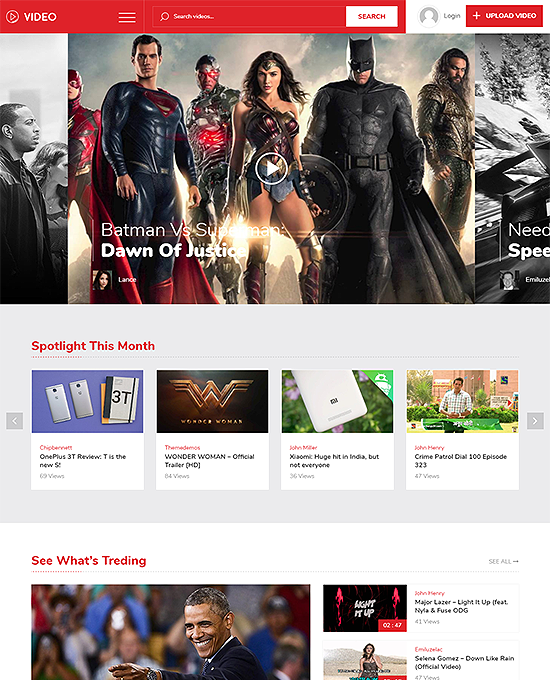 So you YouTube Clone website is sure to impress your users regardless of the device they use. The video website template comes with a fully functional front end video submission form. This form allows the registered members to submit videos by uploading and embedding it. You can easily embed videos from the popular video portals like YouTube, Vimeo, Vine, etc. Also, user can send their own stuff published through their site. The front end video submission form allows all the registered users to submit their videos. But you can decide on what videos you want to be published on your site. The front end Video submission form is ready to use. No need to design or program it. With the sample data installed, the “Submit Video” button will start appearing on your website’s homepage and your visitors can locate it to submit their videos. The Video WordPress theme lets you upload the video directly to the server or embed it from other sites. So, on your WordPress video website, you can embed videos from popular video hosting websites like YouTube, Vimeo, Vine, etc. The video embedding facility is available to both, the admin as well as the front end users. Check out this video submission form. You can choose if you want to upload your video or embed it. If you choose the upload the video, a file upload dialog will appear. You can use this dialog to upload your video from your local drive. If you choose to embed your video instead, you can do so very easily. All your users need to do is to paste the embed code and fill in other required details for the video listing. Once submitted and approved by the admin, your submitted video will start appearing on the video directory website under relevant category. The theme also generates automatic thumbnails to be shown on the video category and home page. You can choose to upload the thumbnail manually or choose to generate it automatically. Creating or designing pages while creating a website is timetaking. Moreover, when you use page builders to create pages, you may not always end up creating a professionally and tactically designed page. So the WordPress video theme comes with multiple, ready to use page templates. There are different variations of the category page to choose from. Besides, there are template options for blog pages, image gallery, etc. While creating a new page on your video website, you have the choice to pick up a full width template or a template with sidebar. You can even create custom sidebar for your page. This gives you all the flexibility of creating a website exactly how you want. eCommerce is possible with this Video template compatible with the WooCommerce plugin. You may need eCommerce features on your website if you want to sell through it. You can use WooCommerce to sell physical as well as digital products through your video website. Therefore, if you want to sell albums, tutorials or physical disks on your website, you can do so. Besides, there can be unlimited uses of eCommerce on your WordPress Video website. The WordPress video themes are designed to create a video website with best user experience. The design you get with the sample data installation is tactically designed with the right elements at the right place. Therefore, with the video WordPress theme, you can create a youtube like website with user engagement. The users are provided with enough content on the homepage to be occupied with and all the navigational links to inspire them to click through your website and visit other pages. Besides, if you want, you can change the structure of your WordPress Video theme. The pages are completely Widget ready and you can easily bring forth the content you want to. So, you can redesign your video website to an even more user-friendly video website. Create a video website with the design you want. You can easily change the colors, fonts, background and the content structure of your video website. These WordPress Video themes allows you to customize your website on the fly with the live customizer. So you can make customizations on your video website, and see the changes real time before you save them. You can try different combinations and see how they will make your website look. Finally, save the one that you like the most. There is a CSS editor for creating unique WP theme. The changes are saved and protected in database. Thus, they do not get erased or changed. Even if you have never used WordPress before, you can easily create a website that looks and works exactly the way you want. The WordPress video theme, lets you make all the customizations you want, without touching a line of code. Only creating a video website and having it live on the internet is not enough. It is essential that the videos on your video portal are found when a user searches for them. Therefore, you need an SEO friendly video directory website that ranks well. And SEO is not something you can take care of once your website is created. You need an SEO friendly WordPress Video theme to get started. So both of these Video themes are SEO optimized. They are built to be SEO friendly and rank well so as to survive the intense competition among the other video websites providing similar content. For SEO optimization of the content that you add on your website, you can use the WordPress SEO plugins like the Yoast SEO or All In One SEO pack. With an SEO friendly Video theme, you can focus on the other features of your video website. Besides, there are other features to support user friendliness of your video website which in turn helps the search engine ranking and the reputation of your site among the users. Each video detail page within the template is user friendly because they are easy to use, non-obtrusive social sharing buttons. They can be used and shared over different social media like Twitter, Facebook, Google +, Pinterest and LinkedIn. This template can be used when user wants visitors to see the content with no distraction. The sidebar widgets does not display on the pages when full-width is selected. All these features, ultimately help you create a video website that the visitors love to spend time on. The WordPress video themes here are designed to be used by both: The non-technical people as well as the technically skilled people. Creating a video website can take days, if not weeks. So here are the Video website templates that are just like ready to use video website. One click to install the WordPress Video themes, and another one to install the sample data. Once the sample data is installed, your video website will start appearing like the one you see in the theme demo. All you have to do now is customize the website and make it look and work the way you want, The backend options are intuitive and easy to use. Besides, the theme guide you get on the theme purchase comes with explaination about the features and how to use them. So you can easily use the options and settings to adjust your video website’s appearance and behaviour. You can create your website on your own without any help from professional developers and designers. If you are a web developing agency and want to create a professional and feature rich video website for your clients, you can use these Video themes. With the Video WordPress theme purchase, you also get one year worth of technical support. So if ever, while setting up your website on your own, you don’t find your answer in the theme guide, you can reach out to us. You can send your queries at [email protected], or use this contact form to get in touch with a support expert. Your questions will be answered by our technical support executives. They will try to respond back with a suitable answer/suggestions based on your questions, as soon as possible. The technical support is available for free for year. After a year, you can still keep using your WordPress video theme without technical support and updates. If you plan on making money through your video website, then you will love this feature of our WordPress Video themes. These Video website templates are designed keeping all the aspects of a video website in mind. When maintaining a resource heavy video website, you might want it to be profit making. To earn through your Video directory, you can use some smart advertising services like Google AdSense or make money online by showing sponsored advertisement banners. The Video WordPress theme comes with all the features to create and manage advertisements on your website. The ad widgets are designed to show the advertisement beautifully, without messing up the design of your website. Therefore, you can create a beautiful website, with advertisements and video on it. These Video Website templates are easy to use and let you create a video website that works accurately. Also, the Video theme is optimized for faster performance. Strict coding standards with optimized modules ensure that your WordPress website loads faster. Special efforts have been made to make sure that your video website’s pages load faster and your visitors find it fun to browse your website. We conclude that best WordPress video themes can be created easily using copy-paste /drag-drop. These are managed through widgets for posting. Template are uniquely created. User can use WooCommerce for ecommerce. Main purpose is posting and sharing videos. Software is compatible with all modern devices, operating systems and platforms. Price basic is $49 for a single domain with lifetime usage license and 1 year of support on themes updates. Premium is $99 and this allows visitors to submit videos also. There are upto 5 domains installations. Also, there is lifetime usage license with 1 year of theme updates and support. What kind of host can I use for my WordPress video website? You can use any efficient host that promises performance and highest uptime. For a video website however, the resources requirement is a little more than ordinary website. So choose a host that can sustain a video website. We recommend WordPress optimized hosting from BlueHost. Learn why? Can I allow registration on my video website? Yes, these Video templates come with an efficient user registration and management feature. The front end visitors can register, manage their profile and upload videos on your website. Can I allow my Video website users to create their own video channels with subscription options? As for now, these WordPress Video themes support video channels. The visitors can click on a username and all the videos by that user will appear on the page. However, these video scripts do not come with Video Channel subscription option like YouTube.